We stock most common media packaging to insure rapid delivery of your completed duplication project. Additionally, we have extensive industry experience in providing custom printed packaging and assembly services. From simple jewel case assembly to elaborate shrink wrapped software packages, we have to expertise to do it correctly. Many standard media package alternatives are available to be customized with your artwork—eliminating the expense and delays of custom tooling. 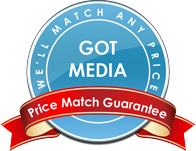 Packaging expertise and experience is invaluable –and GotMedia has those capabilities. Take advantage of our extensive media industry experience—and let us demonstrate our ability to perform on time—every time!